Since the mid-1990s, Shoreditch has been an increasingly popular and fashionable area of London along with nearby Hoxton. Old Street and Curtain Road are known for their pubs and clubs, as well as a number of theatre and music venues that rival the West End. Shoreditch also has a large number of bars, restaurants and art galleries. Once a working class district, the area has been the subject of gentrification over the past twenty years. This has seen a steady increase in land and property values. Many former industrial buildings have been converted into flats and commercial spaces, particularly offices. The new Hackney Community College campus in Shoreditch is also aiding in the area’s transformation. In recent years, Shoreditch has also been at the centre of London’s technology sector. The area is also a major hub for media businesses. Shoreditch is a popular base for web technology businesses, particularly around Old Street and the Old Street Roundabout. Some of the first technology companies to emerge in the area included Dopple, Last.fm, TweetDeck, Songkick, Squiz, Tweet Deck, AMEE, and Livemusic. The high concentration of digital and high tech companies in the area has led to it being known as Silicon Roundabout. 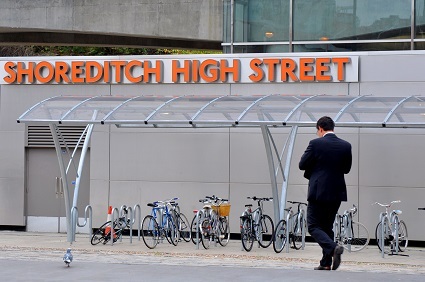 Shoreditch is home to Tech City, a technology cluster that stretches from Old Street to Queen Elizabeth Olympic Park. It is the world’s third largest technology cluster for start-ups after San Francisco and New York City. Between 2009 and 2012, the number of technology and digital companies in London increased 76 per cent according to a 2013 UK government report. The number of tech businesses during this period grew from 49,969 to 88,215, and much of this growth was centred around Shoreditch. During this same period, the sector grew by 16 per cent in London. About 27 per cent of all job growth in London is in the technology and digital sector, which employs over half a million people in the capital. A rival to California’s Silicon Valley, the growth of Tech City has been supported by local and national governments. Businesses in all stages of development are based in Shoreditch, including some of the UK’s leading financial technology (fintech) and e-commerce companies. Launched in 2010, Tech City is also home to several of the world’s leading technology firms, including Amazon, Cisco, Google, Intel, Facebook, Microsoft, Twitter, and others. Other technology firms with a presence in the area include 7digital, BT, EE, Growth Intelligence, Import.io, Inmarsat, New Brand Vision, PaveGen, Qualcomm, Seedcamp, Simply Business, Ve Interactive and Workshare. A number of financial and professional services firms are also found in Shoreditch, including Barclays, KPMG and McKinsey & Company. The cluster is also supported by academic partners including City University London, Imperial College London, London Metropolitan University, Loughborough University, and University College London. Imperial Innovations, a technology-transfer company of Imperial College London, is providing support for a new accelerator space at Queen Elizabeth Olympic Park. In addition, Loughborough University and University College London are working together to establish a presence at the Olympic Park. Companies looking to start a new business in Shoreditch and would like help finding suitable office space click here.